What can you do with unused jewelry? Jewelry is powerful. Serving as a reminder of loved ones, connecting us to our past and grounding us in the present. But sometimes jewelry no longer serves us or it no longer serves it’s original purpose. Loss, divorce, inheritance, unwanted gifts - there can be a lot of reasons why you may no longer want tor fine and precious jewelry - sometimes jewelry reminds you of a painful moment or transition in life. Maybe you inherited jewelry from a loved one that isn’t to your taste; maybe your jewelry just needs a different look. If so, then it’s time for an update. The diamonds in these rings once symbolized a different life, but have now been refreshed, updated, made new. Rings (and earrings) that symbolize a change and a transition through to a new time in life. A jump start, a renewal; hit the reset button. If your jewelry is made from gold or platinum, diamonds and/or sapphires, the good news is that almost all of these materials can be reused and remade into new jewelry. Metal can be melted down or reshaped, stones without major flaws can be put into new setting, and sometimes can even be re-polished or re-cut to look brand new. The jewelry shown here was all rea fashioned from a single wedding set - the small stones were pulled from an unused diamond band and re-purposed into a pair of earrings and a sparkle ball of a ring. 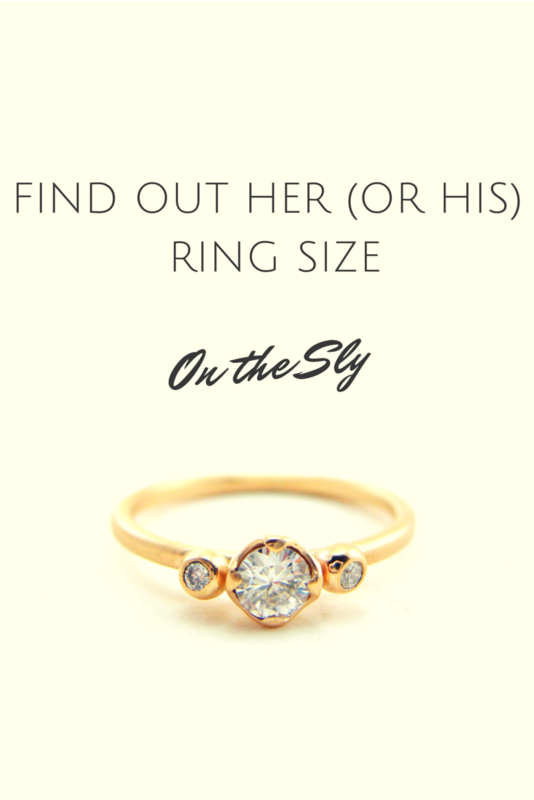 The center stone from her engagement ring was set into a lowered bezel setting instead of the impractical tall prong setting that she had once loved. 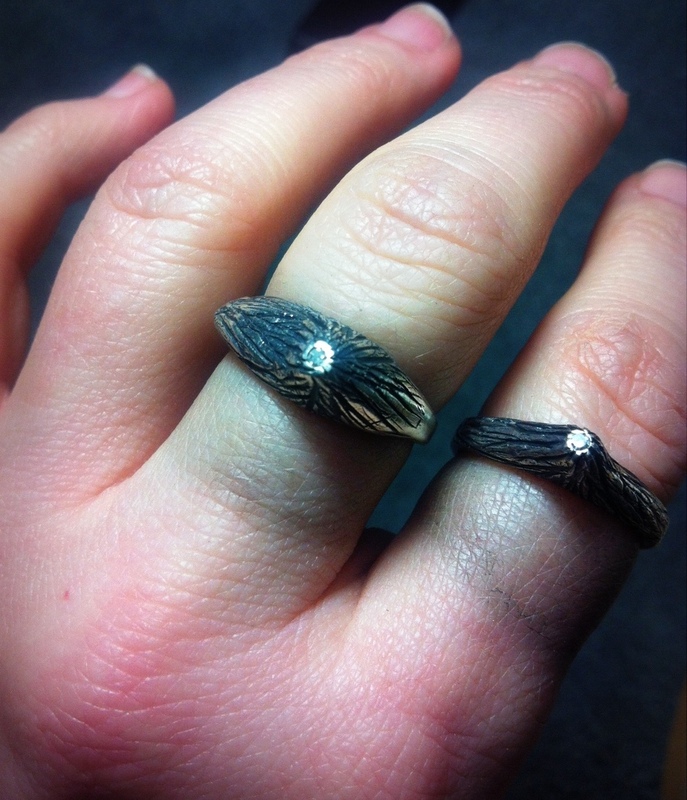 We worked together to customize some of my existing styles to use her stones, and then we turned the leftover metal from her rings in for cash credit. The results? She now has two rings that she can were everyday, and a pair of studs that can go with anything. This is a way better cost-per-wear for her jewelry, and her pieces are no longer gathering dust in a drawer. Do you have questions about transforming your own jewelry into one of my designs? Leave a comment or get in touch directly. Live your values, wear your values. That’s what I always say. OK, not really, but that should be my motto, for sure. A little over 10 years ago, I made a personal pledge to try to shop for products Made in the USA. I felt good about this pledge...until I tried to go shopping at all of my usual haunts. I found a whole lot of Made in China and Made in the Philippines, but not so much with the Made in the USA. Flash forward to 2014 and in many malls and department stores, this is still the same story. I’ve spent some time researching American designers and seeking out makers who are not only committed to creating beautiful clothing, bags and shoes but have also kept their production here. Keep an eye on my blog for more outfits pulled together from American makers in the coming months. Featuring Karina Dresses - made in Brooklyn, Nanette LePore shoes - made in LA, belt and bag by 49 Square Miles - Made in San Francisco and Wabi Sabi Earrings by me - Sharon Z Jewelry - Made in San Francisco.